A security deposit of $250 is also required and will be authorized on your credit card 7 days prior to arrival. A charge may result for damage to the condo, missing contents, keys, or for exceeding the number of allowed overnight guests. CALL THE LOCAL CONTACT IMMEDIATELY IF THERE ARE ANY ACCIDENTS OR DAMAGES TO THE CONDO OR INVENTORY DURING YOUR STAY. please call or email Ryan or Kelly Hass at 808-589-7126 or 808 589-7885 or email them at 808hass@gmail.com. All stays have a checkout cleaning fee of $135. Stays of more than 10 days have additional mandatory interim cleaning fees of $135. For example, if you had reserved the condo for 14 days, there would be one interim cleaning 1/2 through your stay, as well as the checkout cleaning after you checkout. No pets of any kind are allowed in the condo or on the condo lanai. Please do not feed the birds from the lanai. Bath towels are not allowed to be taken out of the unit. Please use beach towels provided. Potential Extra Fees upon check-out --Replacement cost for any missing/broken/damaged items of if any Extra cleaning is required. Being our first time to Oahu and not knowing where to stay we were excited that we were probably as close to the beach as possible without having to stay in a hotel. Ilikai 624 had everything we needed including beach chairs, towels and even a small cooler to tote our lunch to the beach or lagoon. Beautiful views of the ocean. Condo was very clean and conveniently located to shopping and restaurants. Was just far enough away from the overly crowded streets of the Waikiki Hotel strip. Even saw close up the filming of Hawaii Five-0 beside the Lagoon. Our kids loved snorkeling and paddle boarding in the calm waters of the lagoon. The Condo Management Team were awesome to work with and answered all our questions and concerns in a timely manner and most professionally. The keyless entry was a breeze. I would come back. Amazing views of the beautiful Pacific Ocean from your lanai. Close to Ala Moana Shopping Center, and Ala Moana Beach. North end of Waikiki Beach (the quiet end) but less than 20 minute walk to the core of Waikiki. • Spacious 1 Bedroom, 1 Bath Condo • Spacious lanai with large table and chairs for out door dining • Fully equipped Kitchen • Beautiful Furniture, freshly painted, new curtains, closet doors and linens! This view has it all: Ocean, sailboats, surfers, canoes, lagoon, palm trees, city lights. . Enjoy paradise right from your huge 120 square foot lanai! The best seat for Friday night fireworks and listening to the evening luau music. Breakfast, lunch and dinner are all magnificent while gazing at the swaying palm trees and the serene lagoon. Very comfortable and luxurious sofa. WI FI and ethernet Internet. 32-inch black flat screen TV, deluxe cable service with extra channels. Bar stools and seating for four at the kitchen counter. Dining table on the lanai. Upgraded kitchen is equipped for serving a light snack or cooking a gourmet meal. Supplied with cookware and all the kitchen items you could possibly need. Welcome to your meticulously appointed home away from home. Nothing was overlooked to be sure that your stay is surrounded with quality and comfort. Aloha! Remodeled bathroom with Travertine floors and granite counter tops. Plush bath and beach towels. Shampoo, conditioner, and lotion are provided. The Ilikai is located on the north end of Waikiki Beach, directly in front of the Ala Wai small boat harbor. You can see Waikiki Beach and the Hilton beach and lagoon from your lanai. Walk down the Ilikai ramp and you are at the ocean! Take a morning jog or a sunset stroll on the beach walk. Ala Moana Park, a local favorite, is less than a 10-minute walk away. Parking is available at the Ilikai. However, we recommend that you take a shuttle from the airport which will drop you off right in front of the Ilikai. Everything is within walking distance: Beaches, restaurants, fast food eateries, shopping centers, grocery stores, ATM's, banks, and much more. The bus stop is at the corner and cabs are always in front of the hotel. Car rentals are available across the street when you are ready to take a drive around the island. Aloha! INTRUSIVE MAIDS at 9 AM reminding my to check out! Up side: The condo was very nice, as seen in the photos. The bed and linens were very nice. Pillows comfortable. TV and cable worked fine with instructions. Like the fact that I did not need a key, to enter the condo. The grounds and elevators worked well. Neighbors were nice and friendly. Easy access to the beach and lagoon.Down side: Two hours before check out at 9 AM, while take a nap to get rid of my migraine headache. I had to wake up so I could answer the door. It was the maids knocking, just to remind me to get ready to check out! Not only was this offensive, since I am an adult and very much aware that check out was at 11 AM. This interrupted and disturbed my paid time in the condo and a time which I very much needed to rest before a late, overnight flight. I had already been up and packed at 6 AM that morning. The creepy part was, that at exactly 11 AM as we opened the door to the condo and step into the hallway, I was startled by the maids that were standing right outside the door, who said to me as I step outside: "right on the dot"! Of course they said "Merry Christmas" to soften their intrusive behavior, but I was not impressed.Traveling both for pleasure and professionally as a flight attendant I have never, ever had this experience before, to be reminded / pressured to check out of a condo, apartment or hotel room. From North American, South American, Europe to Asian, never once! We had an excellent holiday on Oahu and our stay at the Ilikai made it that much better. We have stayed at the Ilikai on previous trips and have experienced the city view from another unit. We preferred the #624 unit as it had a view of the pools, harbour, ocean and sunset. All amenities at the unit were as expected and complete. We would definitely book this unit again in the future. The location was great and the condo itself had plenty of cupboards and a dishwasher which was the best....view was outstanding and the unit itself was clean with plenty of space to relax after a hard day exploring. Will definitely stay there again when travelling back to Hawaii. Great Place to Stay! Unit was clean and well equipped. A ice maker would of be nice but got along quite adequately with out it. My husband and I took our first ever vacation together this year. Aloha Condos fit our budget, but exceeded our expectations! It was beautiful, clean and very well equipped. We were centrally located with access to all the island had to offer. What made it so great were the people who worked there, everyone was friendly and helpful and made our stay wonderful. We will be back to visit again but next time we're bringing the family and renting a larger place at the Ilikai Hotel/Condos.A special thank you to the owner of Condo 624, you made a dream possible and we are grateful.Regina M.
Very happy with our first experience and stay in Hawaii, staying at the Ilikai in Condo 624. The room was very comfortable and the view and location was great. The Ilikai is convenient; near Ala Moana for foodland store, shopping. Boardwalk to beach is convenient, too, and this is at far end of Waikiki, which is quieter. Parking (valet only) is about $27 with in/out privileges- not a bad price for the area. This unit looks right onto Hilton Hawaiian Village, and gets the music from the rooftop luau across the street there. Ocean view is from afar, as this is set back a bit, but still quite nice. Bed is comfortable, sofa bed passable, kitchen well equipped, 6th floor is lower floor so nice for those who prefer to not be op so high. Very clean, everything working well. Would recommend. Great location & excellent view of the Hilton lagoon & Waikiki Beach! Room was clean & fresh, well maintained. Was disappointing that the top floor restaurant is closed & no access to the view. There was no tissues provided in room as stated , I suppose that was because they were $6.50 a box at the ABC store. You stated there was no late check out but we were able to store our luggage for $1 ea at the bellman desk, they were very accommodating! Overall a great experience & will recommend in the future! Thanks! The condo was clean and had everything we needed. View of lagoon and ocean was perfect.Close proximity to pool, beach, shopping and restaurants. The queen bed was comfortable, the only criticism would be a family member slept on the pull out couch for our stay and found the mattress was in poor condition and should be replaced. Had a wonderful time and would stay in this condo in the future. Thank you for your comments. We are glad that you found the unit to be clean and convenient to everything. It is a perfect location! We will make note on the sofa sleeper and have it looked at and assessed. We do hope you will stay again soon! Thank you so much for your wonderful review. We are glad you found it clean and comfortable. The location is great and the views are amazing. We do hope you can come back and thank you for your recommendations as they are appreciated! Bed was not very comfortable. Every thing seemed to done on the cheap. Only two rolls of toilet paper. Two tiny bars of soap. We appreciate you taking the time to send a review. We are sorry you felt the bed was not comfortable. However it is very hard to please every guest with the level of comfort in a bed. We do have people who love the beds in and given unit and others who don't. Bed comfort is very relative to each person and what they prefer or what they are used to. This unit is very reasonably priced and most vacation rentals as opposed to hotels does have an initial supply of stock and replenish supply is up to the guest. My family and I stayed here in July and found the accommodations to be very nice and the view to be spectacular. Everything was as it was advertised and very clean. The only recommendations I was would have for the owners is that that they have more bath towels available to use and that they replace the pillows. Also the sleep sofa is not that comfortable. It might make sense to replace the current sleep sofa mattress with a memory foam mattress. Overall we were very happy with our stay. We appreciate your taking the time to post a review. We do try to advertise the unit as it is and thank you for mentioning the cleanliness and that overall you were happy with the unit. We will mention to the owner the sleeper sofa but we do find that beds are a individual taste pertaining to comfort levels. Pillow are replaced from time to time and we will check on those. Thanks for the feedback. Fantastic hotel Condos! Room had great view, comfy beds, great AC, kitchen was everything we needed, bath room was very nice with great water pressure in showers and no wait time for hot water. Balcony had great view. Owners provided everything we needed including: beach towels, beach umbrellas, beach chair and cooler, boogie board and float. Lobby was super nice. Walking distance to everything. Very well situated in between restaurants, beaches, parasailing, lagoon and shopping. AWESOME EXPERIENCE for me and my daughters! Thank you for the 5 star rating! This condo is very convenient to everything and we are glad you had everything you needed. The views are special and make for a memorable vacation. We hope you can come again soon! The hotel itself, although older,Is nice. The Aromas Cafe, which is onsite, is a great little coffee shop. The room was nice, but I don't know if we will go the "condo" route again. The condo was well furnished with dishes, eating utensils, pans, etc. however, there were 3 of us for a 6 day stay, and there was only 6 bath towels and 2 rolls of toilet paper for our stay. I felt that with the payment of a $135 cleaning fee, we could have gotten clean towels and more toilet paper. A little extra bedding/pillows would be nice too. Other than that, the place is clean, well kept, and met my expectations. I was more than happy with a recent stay at Condo 624 at the Ilikai. I arrived early in the morning and was able to get into the unit right away and it was clean and had everything we needed. We loved the view over the pool, Hilton lagoon and the ocean. The bed was great and everything was clean and well maintained. I hadn't stayed in this part of Waikiki before but love the location - close to Ala Moana shopping, the "nice" end of Waikiki beach and easy to catch tourist and city buses. Will be back! We had a fantastic stay st ilikai. The facilities were perfect and exactly what we needed when travelling with a toddler. The view is beautiful (especially when there are fireworks in the lagoon). Could not have been happier with our stay. Thank you so much. We were very pleased with all aspects of condo 624. It was clean and recently renovated with a fully functional kitchen containing everything we needed. The view was outstanding looking over the two pools, ocean, Hilton lagoon and Hawaiian Village. We ate all our meals on the spacious lanai. The unit was supplied with beach towels, chairs, cooler and inflatable for our time at the beach which was a short walk away. The staff at the Ilikai were friendly and helpful and everything was well explained by Aloha Condos. Would definitely stay here again. We would stay there again.Great value for the price. Mahalo for your review from your stay at the Ilikai Hotel unit 624. We are happy to hear you found the unit clean and overall great. The views always do seem much better in person! We are noting the mattress on the sofa sleeper and will have someone check into that. The new pool has been completed so I am thinking it was not construction equipment you are talking about when you were describing some noise. Possiblly you might have been referring to the pool pump equipment? We will mention this to the owner to mention to the homeowners association. We have not had other guests that have mentioned this to be an issue though since the pool is on the 2 floor and this unit is on the 6th floor. Condo 624 was everything we hoped for. No negatives at all. Our experience at the Ilikai was as good as could be expected. The room was nicely appointed, the view was quite good and we were very happy with our stay there. Bell, concierge and food service staff were exemplary. If/when we go back to Oahu, we will most likely stay there again. Wonderful place to stay. The condo included all the kitchen, bathroom essentials we needed. Although we were not directly on the beach we had a good view of it from our lanai where we had our Thanksgiving dinner. Nice wading and swimming pool for lounging and a short walk to the beach. Beautiful beach area!! Easy walk to all the shops and stores and to downtown to watch the Holiday Parade. Would definitely stay here again !!!!! Although we have been to Waikiki many times and are familiar with the neighbourhood, this was our first time staying in a VRBO and we were unsure what to expect. Any concerns were put to rest immediately once we arrived in room 624. We couldn't believe we found such a beautiful place to stay for our vacation. The Ilikai Hotel is stunning and perfectly situated for our needs. It was a pleasure to have a short walk to the beach without the need to cross any roads. Although situated at the quieter end of Waikiki, there is no shortage of great restaurants and shopping within walking distance. The room was updated, clean and attractively furnished - just like in the photos. We did not make use of the kitchen (it is my vacation after all :) ), but it appeared to be well stocked. The lani has a beautiful view and is comfortably furnished. The only thing I could say that was less than perfect was that the bed was too firm for my preference; however, it would not stop me from happily choosing to stay in this lovely unit again in the future. I look forward to another visit another year. The room was clean and perfect for us. We were not able to see the Friday fireworks show due to the Hiltons Lagoon Tower but the view of the ocean and hilton's lagoon was nice. I loved not having to worry about loosing a key since the door had a key pad on it. Kitchen is very nice even though we didn't use it. I would most definitely book this place again. Mahalo for your review! This is a great unit and glad you found it perfect for you. The kitchen does add a great element with the possibility of cooking in. This unit is in a great location and does have great views. Please come again. This condo is in a great setting. Convenient to beach, restaurants, shopping. We enjoyed a stay here, it was just the right size for us as we were very busy on tours, etc. Clean and comfortable. I would recommend for others. Clean, comfortable and convenient are the words we like to hear. Thank you for a rating of 5! This unit does have all you need and is in a great location and the views are special. Thank you for your recommendations and we hope you can come again. The Ilikoi is perfectly situated at the "quieter" end of Waikiki, still close to everything, and was perfect. Room 624 was very clean, updated, and quiet. All the necessary amenities and the entire stay went smoothly. I do wish there was a fan in the bathroom, but if that's my only complaint, obviously the stay was perfect. It's a little bit more of a trek to the beach that the hotels down the beach, but that doesn't mean it was far at all, and it was a plus for me as I like a nice walk. I loved staying at the Ilikoi and will definitely book again. This condo is very clean and bright, with a great ocean view. Lots of restaurants near to hotel, and also 2 nice restaurants right in the Ilikai. Would recommend this condo to anyone. The only thing that was advertised about the condo that was amiss, was the fact that you cannot view the Friday night fireworks from the lanai. Other than that our stay was excellent. I stayed at Condo 624 over Christmas 2015. The condo has a small kitchen with open bedroom and living room area. This was big enough for me and my wife. The room was clean and had everything we needed. The stove and fridge are older and probably need to be updated soon, but we were on vacation and they didn't matter. The view is amazing and you can see the ocean from you bed. It has a clear view of the ocean and the hilton hotel next door. You can't see the lagoon as good due to the palm trees covering it from that height, but you can see the ocean very clear. The hotel was great. This hotel is much better than the Ilikai Marine which I stayed a couple of years ago in. This hotel has shopping, market for food and household items, getting setting area, pool for guests to use and much more. Beautiful water fountains and lights at night during the holidays. Everything is within walking distance from places to eat, beach, buses, trolleys, tours and much much more. Having a kitchen is a great asset! The condo was a lovely unit. Everything was very welcoming and sparkling clean. I only used the refridgerator and the microwave but both worked well. I had some trouble operating the TV remote and the air conditioner remote. I would recommend a directions card for each. That is my only suggestion and I would recommend this unit to everybody. I love the location and was able to walk to beach and Mall easily. Thank you so much for your review. We are so happy to hear that you were pleased with the condo and the cleanliness. It is such a bonus to have the kitchen available in case our guest want to eat in. The location is also perfect convenient to everything! We hope you can come again in the near future. Olde World Charm with a view to die for! Personal friendly hosts with very good communication.Beautiful room comfy bed. Totally clean as a whistle with quality linens! Hope to come back to open the door on paradise. Thank you for the rating of 5 on your review of condo 624 at the Ilikai Hotel. Thanks for noting the good communications and the cleanliness of the condo. We do try to be available for our guests. This condo is located in the perfect spot convenient to everything. We do hope that you will be back again soon! The apartment was exactly as featured on the site. The Ilikai is conveniently located in Waikiki. Thank you for your review from your stay at the Ilikai Hotel unit 624. We are happy to hear you feel the unit is exactly as advertised. We do try to have all the information updated and current. The location is exceptional as it is right where all the action is and very convenient to everything. We hope you will be able to come back again. Mahalo for your business. It was a very nice, clean condo and a great view. It can be costly eating out all the time so having a kitchen was nice to have. The condo was exactly as presented in photos, not a thing different. It was super clean and had everything that we needed (except snorkeling masks:). The access to the beach was a brief walk and the pool was refreshing when we didn't feel like going to the beach. The building was nicely located with access to stores, restaurants and public transit. Parking was expensive so we rented a Smart Car that had the option of $10.00/day parking - you had to not mind walking a few blocks every time you parked. The only complaint was how noisy it was when the hotel across the street had their nightly Luau - interesting the first time but became very tiring by day six. We would however go back to this condo despite the noise and just not use the balcony between 5 and 8 pm. Newly renovated ocean view condo overlooking the turquoise ocean and beach cove,Photos accurately describe the condo unit which was extremely clean and modern.Plenty of cutlery, linens , beach chairs with every thing as your disposal for a perfect stay. I plan to cover the highs and lows of the unit. The condo is in a great location. The issue is the maid/cleaning of the unit. The shower had black mold on the doors and floor when we arrived (not adequate ventilation is my assumption). The sheets on the bed smelled like B.O or that they had not been washed and fully dried when put on the bed. Note no extra sheets are available so if you need to change them during the week plan 2 hrs minimum to get them washed. The kitchen was very well stocked and clean (best kitchen equipment I have ever seen in a rental). The bed was comfortable and had a great view of the ocean. The AC works very well and we had no issues with it. One final item. The drapes covering the sliding glass door is so old and worn that you can see pin holes all over the drapes aka dry rot has started. The patio is large and well appointed. We did call Aloha Rentals about the cleaning issue and the maids arrived and spent 4 minutes (yes I timed them) spraying some cleaning solution on the bathroom (whispering how gross the shower was) and left in 4 minutes flat..... not an effective cleaning job. Plus left new sheets that smelled like they had dried their sweat with them. (note they just threw them on the bed and didn't realize they were the wrong size. (had to call to bring another set) The towels they replaced (also with a BO smell) actually were fresh! Final administrative point; bring quarters, bathroom cleaners and laundry supplies (including fabric softener and bleach) to clean the unit on day one. I stay in over 100 plus hotel nights per year in all types of hotels and this is my worst cleaning experience. I don't blame the owner but the oversight of the cleaning service. BTW you can not see any real fireworks from the balcony on Friday night. Just the noise. Mahalo for your comments on Ilikai Hotel 624. Upon your arrival, we understand that you had some concerns about the linens in which the housekeepers did arrive in a timely manner which met your approval to replace those linens with new ones. We have not had previous issues regarding the smell of the linens. Although the housekeepers did offer to change the sheets on the bed, you replied that that was not necessary so they placed a new set of sheets on the bed for you at your request and it was a simple mistake that they were the wrong size. However the housekeepers did return promptly with a set to replace them. A tropical island does bring with it mold and moisture and we do our best to stay ahead of it and once again the housekeepers responded promptly and did spend the time needed to complete the job with two people working on it. Our housekeeping is a high priority for us, as is prompt customer service, and our staff is very dedicated to doing their very best. We continue to work hard to keep the units clean and accommodating to all of our guests and do have many reviews of very happy guests regarding the cleanliness and the great satisfaction with their stay. We will mention to the owners that perhaps the drapes are in need of replacement soon. Regarding the fireworks and the viewing from the unit, one might look at other reviews and see the excitement of other guests that did enjoy the display. We are glad that you found all other features of the unit accommodating and the location to be perfect as well as the wonderful view. Thoroughly enjoyed our stay in Condo 624. We travelled to Hawaii with another couple to celebrate mine & my friend's 50th birthdays. Could not have chosen a better location, just to the west end of Waikiki - not too close to the action, but a short stroll when we wanted to be part of it. Conveniently located near the Ala Moana Shopping Centre and ABC Stores on both corners with easy access to plenty of restaurants and bars. The condo was clean and well equipped with everything we needed in the kitchen. The bed was very comfortable and the furniture both inside and on the lanai were practical and of good quality. The views were great and, importantly for us, the air con worked a treat. The bathroom was clean but a little dated. Booking was a simple, easy process and there was no check in or check out required. All instructions for access were comprehensive and easy to follow. The managers were very friendly and answered all our enquiries when booking in a timely and helpful manner. Would not hesitate to recommend this condo to anyone and would certainly return if we go back to Hawaii. The 3 of us enjoyed our stay. Using Aloha Condos to rent the place meant there was no check in or check out delays which was great. They were very good. The apartment has great views over the Marina and lagoon, and is nicely done inside - good quality sheets, pillows, towels etc. Big comfortable bed which my daughter and I shared. The fold out bed is best for one teenager or 2 small children. It wasn't as comfortable as the main bed. Free Wifi always makes the teenagers happy!I thought we would use the kitchen and dishwasher but it was so cheap to eat out particularly at the Ala Moana Food Court (which was in walking distance), that we ended up not using either. Aloha and Mahalo for your recent stay with us. We truly appreciate your comments and are pleased you enjoyed your vacation with us. The Ilikai Hotel is in a fantastic location, conveniently located in Waikiki and within walking distance to the Ala Moana Center Mall. We hope you can stay with us again soon. 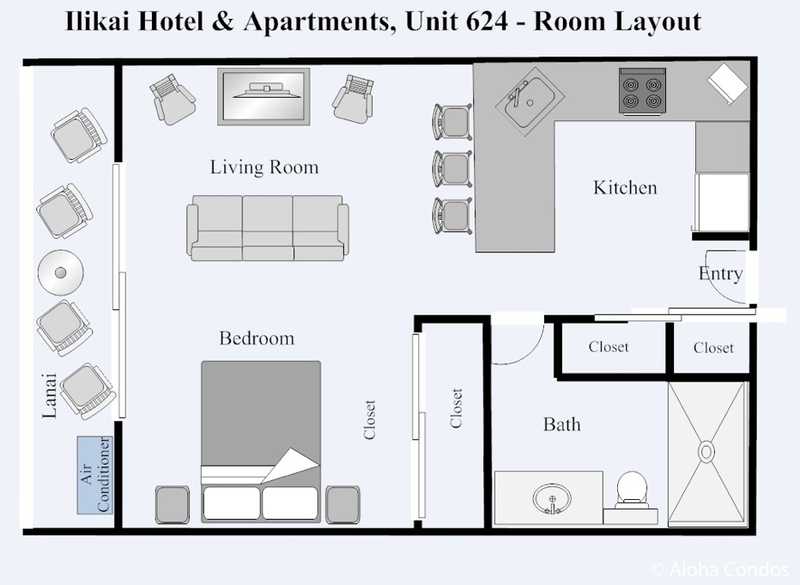 It was our first visit to Hawaii and we were happy that we chose unit 624 at the Ilikai! The kitchen was well equipped. We enjoyed having breakfast on the lanai with the beautiful view of the ocean and lagoon! We loved the Friday night fireworks viewed from the lanai! The location is great! We didn't rent a car for our stay but instead rented a car daily when needed. There are car rental places across the street and at the Hilton next door. Worked well and there were no parking fees! We also took the city bus several times to Diamond Head! The ala Moana Mall is an easy walk and there is a Walmart behind the mall. The unit has beach chairs, coolers and also a cart for groceries! The keyless entry was great! We had a wonderful vacation and when we return we will stay in #624 again! Everything we needed in a well-appointed, airy condo. Our week spent in Condo 624 was lovely. The view, the location and the amenities were everything we could want or need. I would recommend this unit to friends without hesitation. If I were to make one suggestion it would be that included in Rules and Relations should be an encouragement to parents of young children to keep the running and jumping to a minimum. We had banging over our heads from 6 to 9 PM every night. Otherwise, a wonderful experience. Great for - Anyone who wants to stay close to the Waikiki beach and Hanauma Bay, watch the fireworks on Fridays, go for water sports and is visiting Oahu for at least over a week. Booking - Simple and helpful customer service. Food - Good restaurants around. Well-equipped kitchen which we used mostly for breakfast. Parking - The only complaint I had was the daily Parking fee of $28, which was insanely expensive. There was no concession that you were a guest in the condo. We enjoyed our stay at the Ilikai 624. The location was great with many things within walking distance (bus, grocery, resturaunts etc.) Unit was updated and comfortable. The kitchen included everything we needed to prepare our meals. The lanai was comfortable and the view of the ocean was nice. The Friday night fireworks, although visible might be better seen from closer to the beach. The only drawback was the lack of space to store clothing. Overall our stay was enjoyable and we would stay here again. Great condo, you can see the Laguna and beach, gorgouse View! 2 min walk to beach! Clean, air conditioned! Fully stocked with everything. Resturants walking distance from hotel! Great place to say ever better price! We will be back! This is a great location, although people wishing to be closer to the Waikiki action may find it to be a bit of a walk. The condo was immaculate and very easy to self-cater, with a great view and nice finishes. A true one-bedroom would have been nice but these are rare in this area, so with respect to value for money in this spot I highly recommend it! Condo 624 was an excellent choice for us to use as a quick getaway from the rainy Pacific Northwest. It was super clean, quiet, and well equipped. There were even beach chairs and a cooler for us to use if we wanted. Plus, it is very conveniently located to restaurants, stores - and most importantly, the beach! I recommend it highly. I will certainly stay there again. My husband and I stayed at this condo for 5 days for our honeymoon and we loved it. Well located and close to the beach. It would only take us 5 minutes to get to the beach. There is also a mall 2 blocks away if ever you want to go shopping and many restaurants within walking distance. The bus is easily accessible to get to waikiki beach or diamond head. I'd recommend this to anyone. We thoroughly enjoyed our stay in Condo 624. It was very clean and the facilities were great. Everything we needed was within walking distance and the bus/trolly stop was right out front. I would highly recommend staying here when in Waikiki. We couldn't have wished for better accomodation. The unit was very clean and spacious and the Ilikai is well placed, close to the beach, shops and transport. The view from the lanau was great, especially for the Fiday night fireworks. The booking service was exceptional and easy. We will stay here again on our next visit. Great modern condo, everything seemed to be updated and you could spend all your eating hours there. The hotel itself had a good supermarket with reasonable prices. There was also a pool but we didn't use it. (why when ther's a beach nearby). The hotel staff was very helpful and pleasant. The location was great with a variety of restarants and shops nearby. The beach was close & very clean. Various car hire firms just across the road in one building) and public transport very close.We liked everything, the condo (and the ease of booking) the hotel (and its facilities) and the location. We can think of nothing that we disliked except maybe the flight over, ( If we can avoid flying United we will do). We love Ilikai Condos so much, we will never stay anywhere else on Oahu!We absolutely love unit 624. This unit has a new and quiet a/C unit. The lanai is shaded so that keeps the unit nice and cool!Comfortable couch and beautiful kitchen. This was my first time to Hawaii and to Oahu! After a lot of debate whether to go with a hotel room or a private rental, this condo seemed to be the perfect mix of both! It was also one of the more updated interiors with great finishes. The condo has everything we needed for cooking, for the beach and for living comfortably! It was true to the pictures and even had updated shower doors and is very open concept. The best things about the condo were the keyless entry and the lanai! You can come and go whenever you want without fumbling for a key or card to get in. There were also many rainbows you can see off the lanai and enjoy the water features from the deck while enjoying coffee. The Ilikai has a great bar & grill which was very affordable especially during happy hour. It also had traditional Hawaiian live music and fireworks on Friday! I loved the proximity to the aBC stores (convenience), Ala Moana mall, and how it is within walking distance to the heart of Waikiki. It is also easy to hop on the highway and go to any part of the island. Kat with aloha Condos was great with the reservation and answering any questions I had before the trip and during. The condo at the Ilikai was great and we wish we could have stayed there for many days after! We even found ourselves missing the condo for the few days while staying friend's at their house. We miss it already and would go back! Facility far exceeded our expectations! Could not have been happier with our condo and the Ilikai experience. The room inside the condo was more than we had expected, the facilities at the Ilikai were comprehensive and catered to our every need/request. Staff of the Ilikai was engaging and very inform of the services at the hotel and surrounding area. Thanks for a wonderful vacation! I must say I had the most amazing time in Hawaii this trip. The condo was incredible, not in the middle of the hustle and bustle of Waikiki. The room itself was clean, convenient to shopping, and was great for the days when we wanted to just eat in. We saved a lot of money thanks to the full kitchen. We ate breakfast every morning on the lanai...great weather and view to start the morning off right! The check in was easy because there wasn't any! We did not have to wait in line or deal with the front desk. We went directly to the room unpacked our bags and went directly to the beach. They also have a little general store where you could get packets of condiments (ketchup, mustard, jelly, etc.) if you don't want to buy those things at the grocery store. I would recommend this condo to any and everyone looking for a great value, great location, and great view. The only thing I can slightly complain about was that parking was $25 a day. We had to pay upfront because we were not a hotel guest. I was not expecting that at well. Nonetheless, I got over it quickly when we got up to the room and realized I was on vacation in paradise! The Ilikai Hotel and apartment is the place to stay. The staff is very friendly and helpful. Our condo was super clean and comfortable.The view, especially from the lanai, was spectacular. We enjoyed the luau music from the Hilton Hotel next to us, and the quiet of the evening sitting on the lanai. The pool was one of our favorite spots. Waikiki is still the best place for a vacation, and the Ilikai Hotel and apartments the place to stay. Condo 624 felt like home. The vacation was too short. We thoroughly enjoyed our stay at the Ilikai 624. The unit had everything we needed, including beach chairs and mats. The location is quiet, away from the noise of Waikiki. We liked having the Hilton lagoon next door, and had the option of using that or the beach or the Ilikai pool. Close proximity to the mall (8 minute walk), and at least 3 aBC stores within steps of the hotel. The keyless entry was also a plus. We would highly recommend unit 624 to others. Great studio condo in a great location. This is our third summer in Hawaii. Each time we have rented a condo at the Ilikai and have been very happy. This condo had a great ocean and lagoon view from the lanai. Kitchen had all the conveniences except we could not get the coffee maker to work and there was no manual available. Wifi connection worked great. Bed was comfortable but seemed smaller than a queen and the sheets did not fit the bed well; either two flat sheets or the other set was not the right size. Loved the convenience of keyless entry. There was no access to the cleaning supplies and we stayed there for 13 nights with no ability to clean the floors or bathroom, that was a bit frustrating for us. Overall, our stay was very comfortable and convenient to surrounding restaurants and attractions.